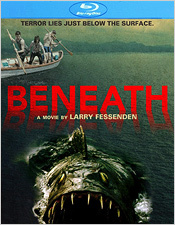 Beneath is a horror film about a killer fish that was premiered theatrically in 2013 and later on the Chiller TV network. It was directed by Larry Fassenden, an underground writer/director/actor, who also directed films like Wendigo and The Last Winter. When it comes to modern horror movies, especially those that are made by and for cable networks, I try to walk into them with an open mind. I really do. I’m especially careful when it’s made by up-and-coming filmmakers, as well as the cast and crew. Sometimes the harshest judgment can really wreck careers for people. But that being said, Beneath is merely a passable horror movie. There’s nothing particularly special about it, but there’s nothing overtly bad about it either. It’s very mediocre. It does make me stop and wonder when this genre is going to die down for a while and come up with something fresh again. Tales about lake monsters, zombies, vampires, werewolves, or whatever the antagonists may be, the genre has just been beaten into the ground with a hammer. Even the schlock isn’t enjoyable anymore, and I think part of the reason for that is because of how much easier is to make a film, get it promoted and get it seen by the public than it was 40 years ago. But I’m getting a little off topic here. Let’s stick to the film. Like I said, it’s mediocre, and the main reason for that is that it throws every possible cliché into the story, and yet I’m supposed to take it seriously. Really, they played things way too seriously, and I can’t honestly take a rubber fish monster seriously unless there’s more to it than standard horror film fodder. Fessenden seems to be obsessed with Jaws and wanting to do something similar to it. The problem is that Jaws holds up because of how well it was made, how well it was written and how superbly well-acted it was. Sure, it had a mechanical shark that didn’t look great, even back in 1975, but everything surrounding it made it work. Seeing a rubber fish monster go for a bite of a swimmer and then switching to a CGI swimmer beating on a chomping rubber fish monster without cutting pretty much summarizes why this movie doesn’t work. It also attempts to have an untold backstory to make it more mysterious, but unfortunately our characters are clichéd horror movie teenagers, so I don’t really care. And it doesn’t help when one of them is running around with a camera all the time, ala Cloverfield, just to have a different camera angle at times. It’s all off-putting. But while I’m watching it, I kept reminding myself that Beneath is a film that was made for Chiller and not for Sci-Fi (or SyFy, if you prefer). The movies that particular channel airs are like a plague. They miss the point entirely about how schlock and unintentional humor work. People that make movies don’t want their audiences to laugh at them, but sometimes they do, and sometimes they laugh so much that those films become popular because of how unintentionally funny they are. Making something with that in mind just doesn’t work. Thankfully, Beneath isn’t that, but it isn’t anything special either. It’s a slightly competent monster movie that doesn’t really have a clue, which is about the best way to describe it. Despite the film’s shortcomings, Beneath on Blu-ray features a very strong HD presentation. Since the film was shot in HD and there’s likely been a digital-to-digital transfer, there’s little to talk about as far as image quality is concerned. It looks fantastic with lots of fine detail, deep blacks, lush colors, and well-balanced brightness and contrast. It’s what you would expect. The film’s audio tracks are in English and in both 5.1 and 2.0 DTS-HD. The 5.1 track is very adequate, with plenty of low end frequencies and ambience. Dialogue could have been adjusted just a bit to get it up there a little more, but I didn’t find myself lost very much because of it. Like the video presentation, it’s about what you would expect. It’s extremely good with plenty of clarity. There are also optional subtitles in English for those who might need them. For the Blu-ray’s extra features, there’s a decent assortment to look through. There’s an audio commentary with director Larry Fassenden and sound designer Graham Reznick; the film’s theatrical trailer; the A Look Behind Beneath: Making “The Fish Movie” documentary; a Poster/Premiere video snippet; From the Web video segments (What the Zeke? and What’s in Black Lake? ); a Fassenden on Jaws featurette; and finally, a paper insert with a Digital Copy code. The best extra, by far, is the Fassenden on Jaws segment, which is, more or less, a short film the director made in film school, and then some. It features miniatures, stop-motion animation, and classic, old school 16mm filmmaking. I would rather have had an entire Blu-ray devoted to this rather than the main feature, personally. It really showcases part of the reason why the film doesn’t work. Beneath sinks because it doesn’t know how to properly handle its material. It’s an ok idea, I suppose, but unfortunately not executed well enough to be memorable. The characters and their actions are uninteresting and the lack of any real characterization kills what could have been a fun, but schlocky, monster movie. And like most horror movies nowadays, there are too many supermodels running around, acting like teenagers, horny and drunk, with nothing more to them than their looks. Sorry to be so hard on the movie, but middle of the road just doesn’t cut it for me. So to wrap this up, it’s a nice Blu-ray presentation, but not a very good film.